bebop spoken here: Tower of Power @ Cheltenham Jazz Festival, Town Hall - May 6. Like the first full-on funk band, Sly and the Family Stone, they're from California - Oakland to be specific - and this has been reflected in their multi-cultural membership throughout their fifty years. There are at least two original members and possibly four. I've tried to identify the nominal leader, saxophonist and occasional singer and think it's most likely Emilio Castillo, with Steve Kupka on baritone, known as the funky doctor, the only other certain original. As well as the horns, they're famous for launching Lenny Williams solo career, their singer during funk's heyday in the early/mid-seventies. Castillo introduced their new singer Marcus Scott as one of the best they've ever had and he looks and sounds just like Williams. The polite sit-down venue of Christian McBride just a few hours earlier had been transformed into a raucous all-standing, all-dancing veritable nightclub, chocker to the rafters. 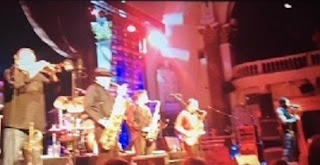 The band was hot from the off, the horn players dancing like vocal harmony groups, loads of real Hammond and rock guitar. All their funky hits, with some new ones and they haven't missed a beat in forty years. Scott was wooing the ladies on the slow ones and showed his moves to I'll still be Diggin' on James Brown, turning into I got the Feeling and back. What is Hip? predictably provided the finale, turning into Soul Power, the chant turning into 'tower of power' and then back to What is Hip? A remarkable end to a remarkable day.